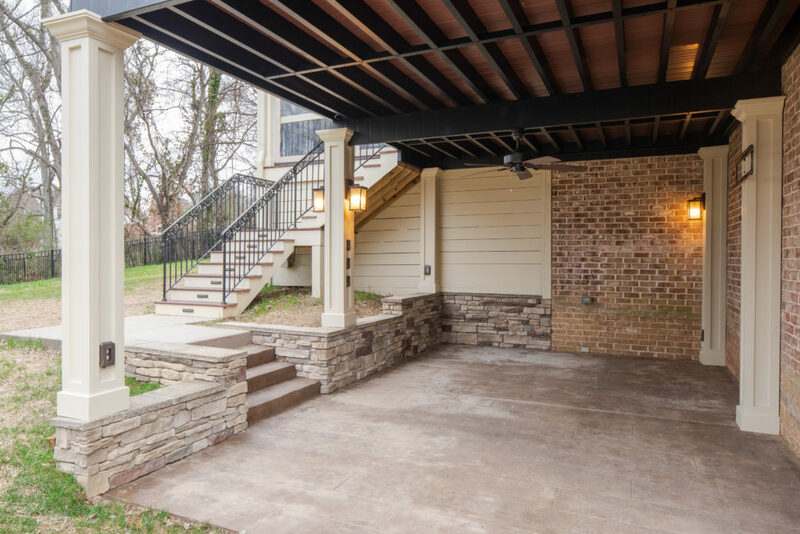 WEST NASHVILLE DOUBLE PORCH AND DECK BY THE PORCH CO. If you’ve ever wanted to see a porch with all the bells and whistles, this is the one. Today’s featured project in West Nashville, TN, handsomely blends creativity and technology with elegance and whimsy. The Porch Company designed and built this double porch, deck, under-deck and kids’ playhouse combination project with several custom features. We also incorporated some of our favorite products such as our hollowed-out timber mantel that hides wiring for your electronics. The timber mantel is one of the innovative products The Porch Company developed out of necessity. You can now purchase one of these gems through our PorchCo store. Previously they’ve only been available to clients for whom we built porches in the Nashville area. Don’t be confused if you see a second deck above the first one in the photos. The top deck was already there when we started our project. Everything else you see here was added by us. A double porch is an extra-large porch, technically one big room but functioning as two outdoor rooms. 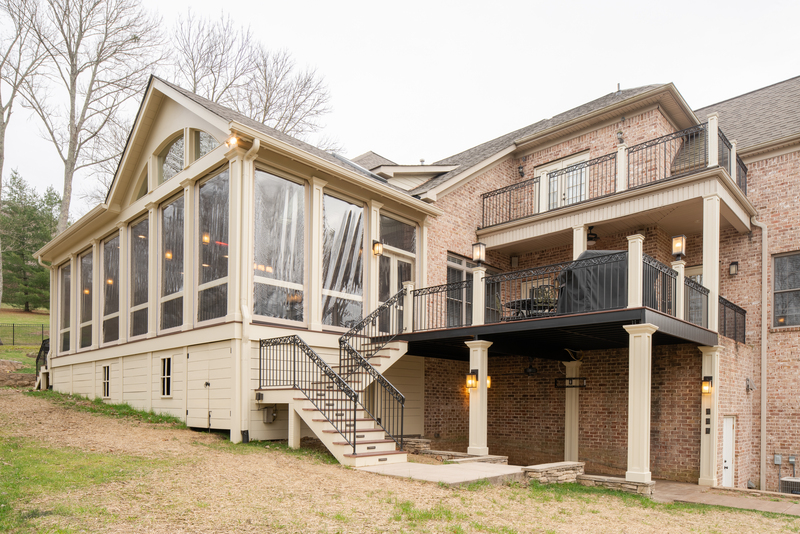 The two areas within this screened porch are designed and furnished as separate spaces. What makes this a double porch is that the two sides each have a different roof style. 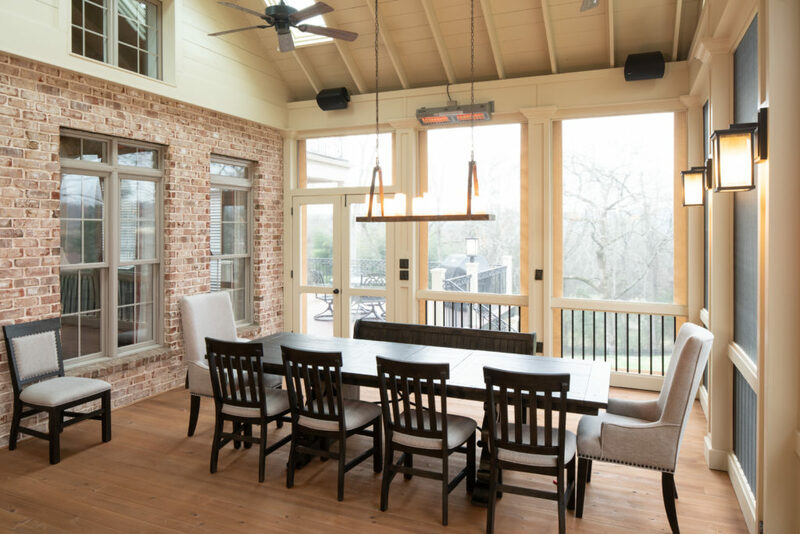 In the case of this West Nashville project, the dining area has a gable roof with an open-rafter ceiling. 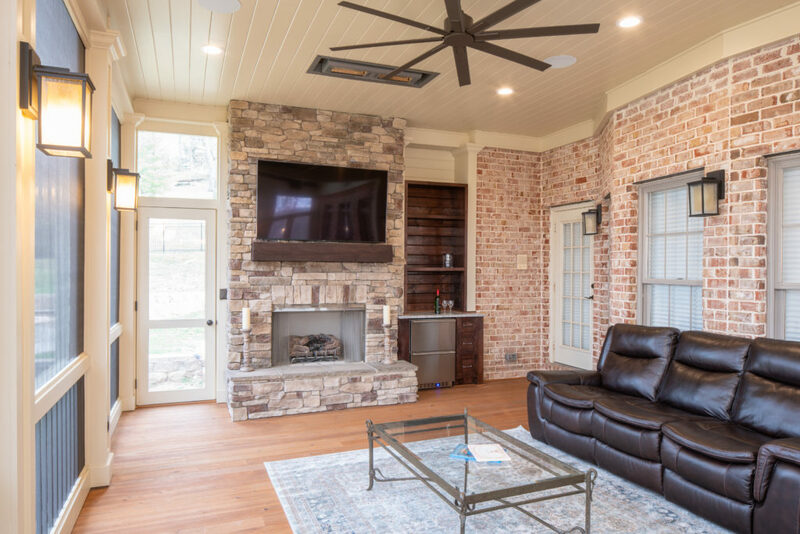 The other section, designed for lounging, watching TV and enjoying the gas fireplace, has a flat roof with a tongue-and-groove ceiling. From a design standpoint, we always tell homeowners to create two rooms when they have two different ceilings. It’s important – as part of the porch design – to lay out furniture to make sure it all works. What’s a Dry Deck – and Why Might You Want One? The term dry deck refers to the addition of a system that prevents water from dripping down through the deck. In the case of this West Nashville porch-and-deck project, the space under the deck can be used as a covered outdoor room. But only if it stays dry! This under-deck area, not yet furnished, has great potential. We built it out with TV brackets, lighting and ceiling fans. The homeowners plan to furnish the space and mount a TV under the deck. The dry deck system is complicated but the results are always worth the effort. Turning unusable space into usable space is pretty much always a winning idea. For this project, we used a Dexerdry which is a gasket that fits between the deck boards. We also used the Fortress steel floor joist system, which you can see from the under-deck view looking up. Our friends at Walker Lumber in Nashville, as well as Southeastern Distributors, assisted us with this dry deck solution. We feel creative every time we install one of our hollowed-out mantels on a client’s porch. Understandably, we’ve loved the idea of hiding electronics wiring inside a hollowed timber ever since we began developing it. We’re excited to now offer these mantels in the PorchCo store! The stonework on the stunning gas-burning fireplace is manufactured stone and is hard to distinguish from natural stone. This is a gas, ventless fireplace. 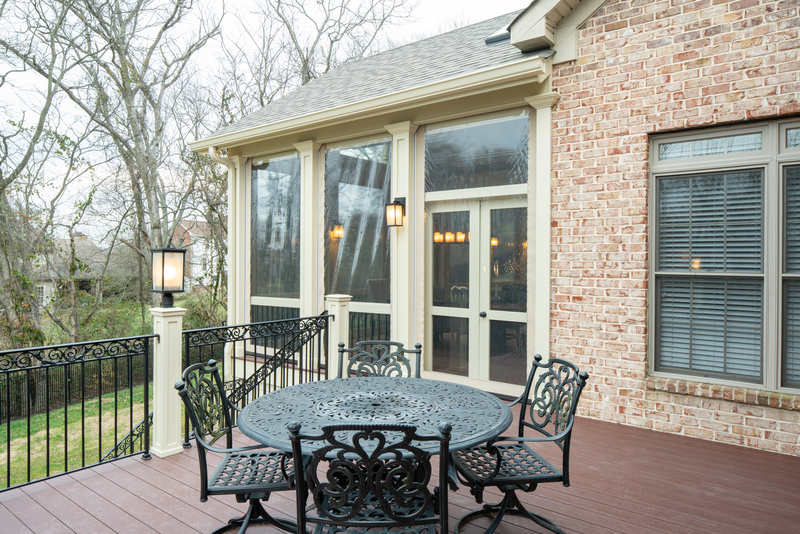 Adding a screened porch can reduce the amount of daylight entering the home. To remedy that, we installed skylights in the gable roof over the dining area of the double porch. 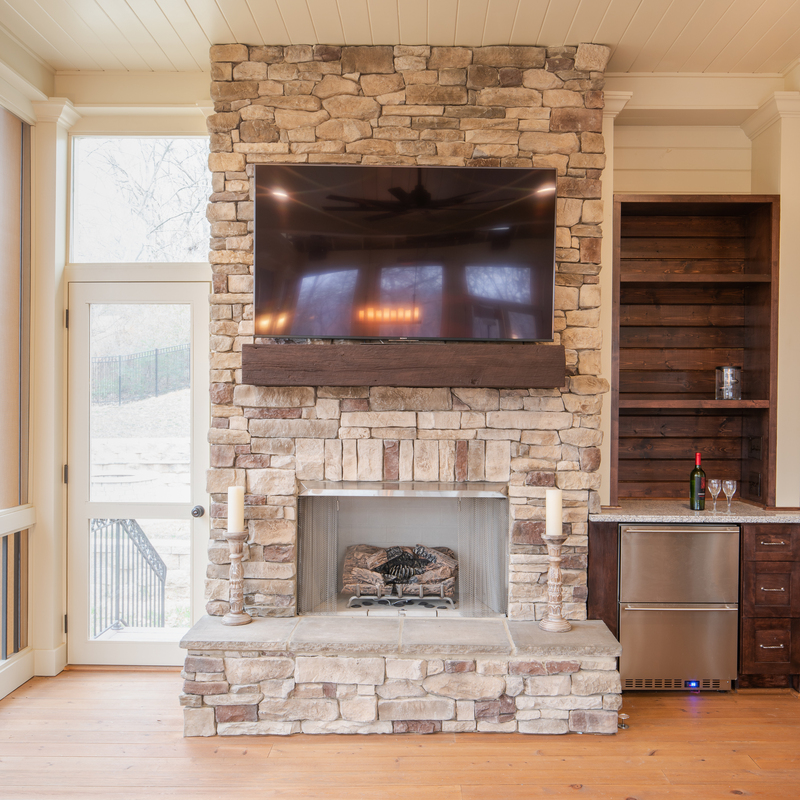 Next to the fireplace is a wet bar area featuring custom cabinetry The Porch Company designed and built using refrigerator drawers. Have you ever seen such a cool hanging light fixture as the one over the dining table? Very artistic! You have to look closely to determine that these unique lights are not actually candles set on a rustic board. Love it! The West Nashville homeowners wanted to be sure they could block wind and rain from entering their screened porch. The solution we provided was to custom-mount a series of clear, vinyl curtains on the outside of the screens. These amazing see-through vinyl curtains are controlled electrically! The clients have the option to lower them part way or all the way down. When the curtains are lowered, they stay taut. To mount the vinyl curtains we modified our columns and header to allow the canister and track to be completely hidden. We further customized the installation by configuring the curtains so one of the porch doors can open freely at all times. This door opens independently of the rest of the clear curtains. The porch door on the other side is covered by the vinyl curtains when they’re lowered. While this door can still be opened after you raise the curtains, there is a bit of a delay. So if anyone is in a hurry, they have one door that can be opened without waiting for curtains to be raised. For additional warmth on chilly Tennessee days and nights, The Porch Company installed 4 radiant heaters inside the double porch. The two heaters in the lounge area are recessed into the ceiling because there we had room to work with above the ceiling. The other two heaters are mounted on the header around the top of the porch. 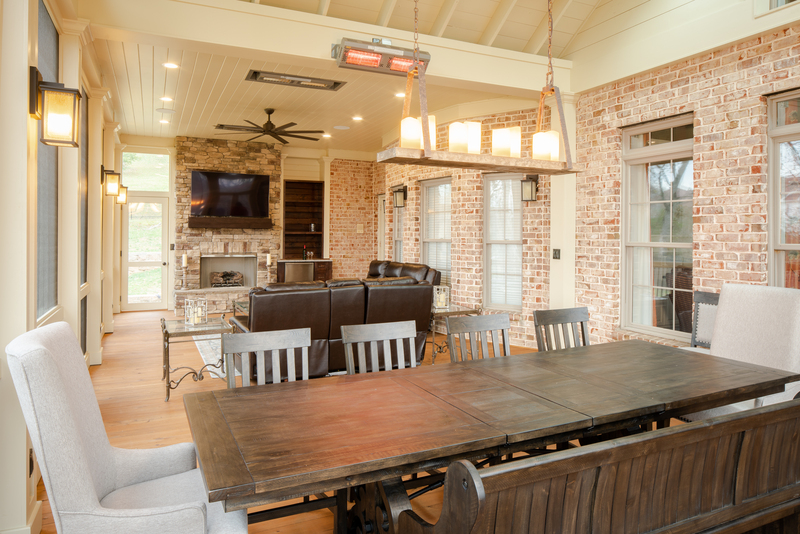 The open rafter ceiling design did not allow space to recess heaters in the dining area. We frequently install these infrared heaters on porches, and our clients love them. They’re extremely effective in areas where you cannot completely close off a space to keep the chill out. Infrared heaters warm whatever objects – or people! – the infrared rays touch as they radiate into the room. When the vinyl curtains are down and the heaters are on, everyone stays warm and toasty inside the large screened porch. If you look up elegance in the dictionary, you may see a picture of our box columns! We custom-designed these box columns to match those already on the home’s exterior. You can see one of the original box columns on the upper deck – the deck that was there before we began this project. While all of our Porch Company columns are wrapped with a PVC sleeve, our normal sleeve doesn’t have the recessed area the box columns do. The arch above the door, in the transom, contains a fixed piece of glass and makes a lovely window. For safety as well as an understated glow, we included subtle stair lighting on the steps to the deck. 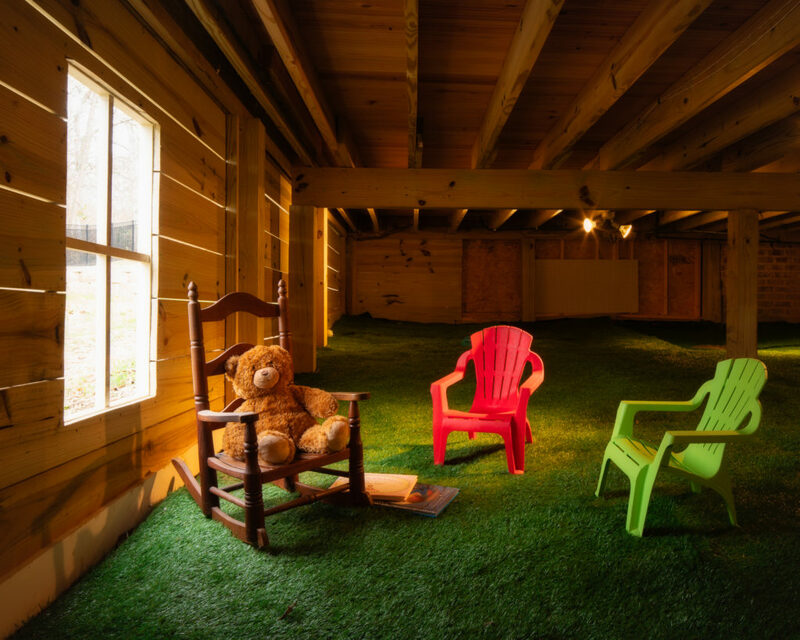 Finally, we come to the fun and inviting playhouse under the porch. We can’t take credit for the inventive idea, just the installation. The clients suggested we outfit the space under the porch to serve as a playhouse. We installed little windows to mimic a playhouse design. The green surface you see is AstroTurf! We covered the entire playroom to give the kids a floor that will be softer than concrete. The clients selected AZEK decking for their new deck. We were able to match the new railing to the original iron railing used on the home. Its filigree pattern at the top edge is also quite elegant. The porch floor is made of tongue-and-groove cypress flooring, our favorite. Altogether this project is huge: double screened porch, deck, covered room under the deck and kid’s playroom under the porch. That’s five new living spaces in one project! The Porch Company designed each of these spaces for a specific function. These West Nashville homeowners now have several new options when deciding where and how to spend their time. 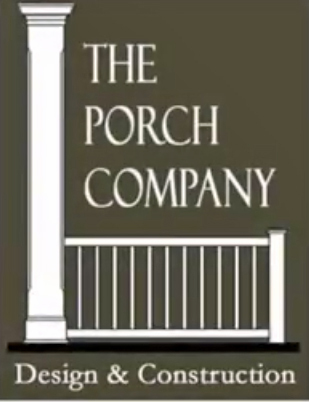 If you are interested in having The Porch Company design and build the perfectly-designed porch for your home in the Nashville area, call us at 615-663-2886 or come by our design studio. We look forward to doing business with you.